What is greeting card studio? Can I add my own image to my greeting card? Can I save my card for later use? Can I change the background of the template? How do I print a greeting card? How will I come to know which card fold is my greeting card and which type of printer should I use to print? How do I add graphics in my greeting card? Can I add my own wishes to my card? How do I start making a card? Can I send my designed card by email to anyone? Can I Upload my greeting cards to Facebook? Can I upload my greeting cards to Picasa? Can I Upload my greeting cards to Flickr? How do I select the size of my card? Can I change color of the objects used in greeting card? Can I move the text of the greeting card? Can I add border to my chosen background? 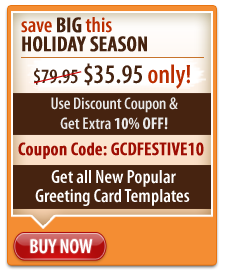 Greeting Card Studio is software that helps you design professional looking greeting cards for your near and dear ones. It enables you to be imaginative and creative, with the help of free bundled professionally designed templates. You can design cards of your choice by adding background, shapes, graphics, symbols etc of your choice. Yes, you can add your own image to your greeting card. Greeting Card Studio has an icon named Image in left menu. By clicking on Image you will be see a window named Select Image. You can select your own image from your computer and put it in greeting card. In case you want to crop the image then you can enable Crop option and crop the image according to your choice then click OK, otherwise if you do not want to crop then you can use the image as it is. Yes, you can save your card for later use by using the option named Save from toolbar or from menu bar. The file is saved in the GCDP format understood only by this software. To print your Greeting card, click the Print in the Menu bar. When you will click on Print a new window named Print Preview will open. Here, you will see the print preview of your Greeting Card. The printing process is different depending upon the fold of your card. a) For Half Fold Tall and Half Fold Wide Cards: The Print Preview window is divided into two sections. The left section will show the preview of the front and back view of the card and the right section will show preview of inside1 and inside 2 of the card. It is important to understand here that for printing your card, you are required to select duplex printing option in the printers. The Fold type of the card is mentioned in the Status bar below workspace. It is also mentioned when you choose any of the templates. How do I add graphic in my greeting card? a) Symbols- Symbols are black and white. The left side has the names of categories of symbols and on the other side you can see a variety of symbols for each symbol category. You can select any symbol category and then any symbol for your card and click on option Add to Card. b) Clip-art- These are colorful pictures. The left side of the window has the categories of the clip arts and the right side has the pictures or clip arts for you to choose for your greeting card. You can select any clip or picture and click the option Add to Card.. Yes, you can add your wishes or text by using the design element called text. You need to add Text in the text box that will immediately appear on the workspace or by selecting Add text from Insert option from menu bar. You can start by two ways- Create your own card or Use a Card Template. All you require to do is select your preferred option and click on it from the opening window. Yes, you can send your designed card by Greeting Card Studio by email. Just publish your card in the PDF format and share it with your friends, family and colleagues by sending it through email. Answer is yes you can upload your greeting card to Facebook. Thing you need to do is, design a greeting card go to File Menu> Upload to Facebook. On selecting this option, you will be redirected to Facebook on a browser where you will be asked your email Id and password for Facebook. On entering the Id and password you will be asked if you want your greeting card to be uploaded on Facebook. Click on allow button and your greeting card will be uploaded to Facebook. After you create your greeting card, you can upload them to Picasa by going to File Menu>Upload to Picasa. On selecting this option, a new login pop up will open, fill in your Picasa login ID, password and then press authenticate. After authentication, Greeting Card will automatically be uploaded to you Picasa album. You can upload your Greeting cards to Flickr by going to File Menu>Upload to Flickr. On selecting this option, you will be redirected to Flickr on a browser. You will have to manually grant permission for accessing Flickr for the 1st time. After that, the selected Greeting card will be uploaded automatically to your Flickr account..
Can I change the color of objects used in Greeting Card? You can select any object placed in your worksheet and change its color according to your wish from the property panel that appears in the right hand side of the sheet. Yes, the objects placed in the greeting card can be moved and placed anywhere in the card using the mouse. You can even rotate the text to any degree you want from the Property Panel in the right hand side of the workspace. Yes, you can add Border to your selected background. To add border, you have to click on Background icon and select any kind of border designs available in the Background window. After selecting your border click Add to Card and your chosen border will be added to the background.